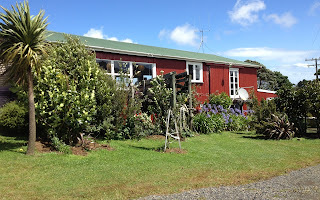 Mountain Dreaming Studio - 142 Waimaunga Road, Raglan. Summer School at Raglan’s Mountain Dreaming Workshop. January 12 - 15th, 2013. Susan Flight; the director at Mountain Dreaming Arts Workshop in Raglan, held a four day Clay Adventure Summer School last month. The studio is situated on the slopes of Mt Karoio, in a shearing shed taking in an inspiring view of harbour, mountain and farmland; artist friendly and designed for creativity. I joined thirty other artists, who had travelled from near, or as far as Christchurch to attend. 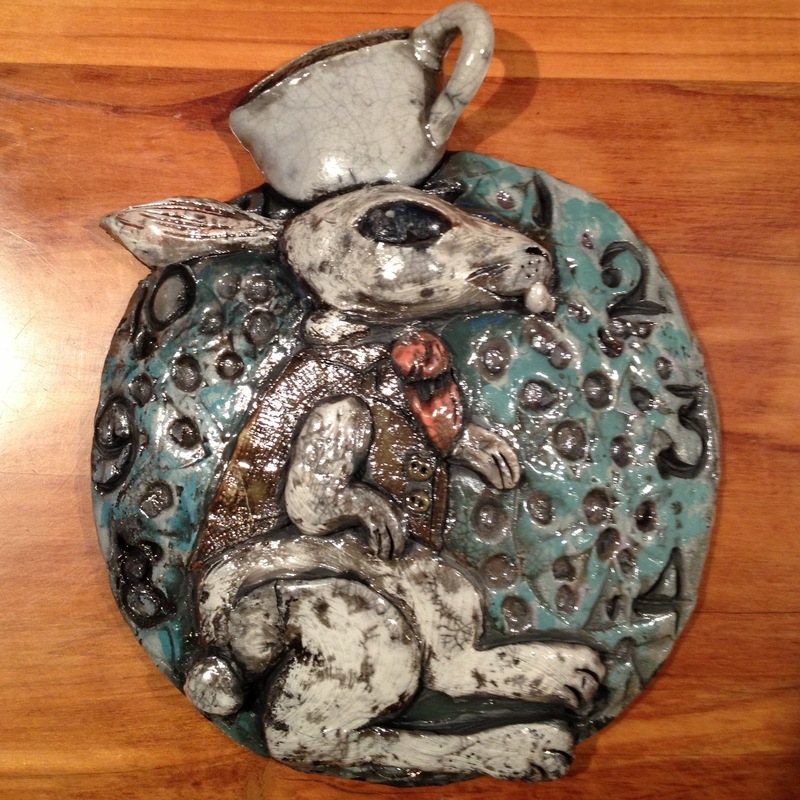 Susan tutored a whimsical sculptural class, where students were challenged to create a sculpture and a wall piece illustrating “the world of Alice” at the mad hatters’ tea party, which was raku fired on the last day of class. 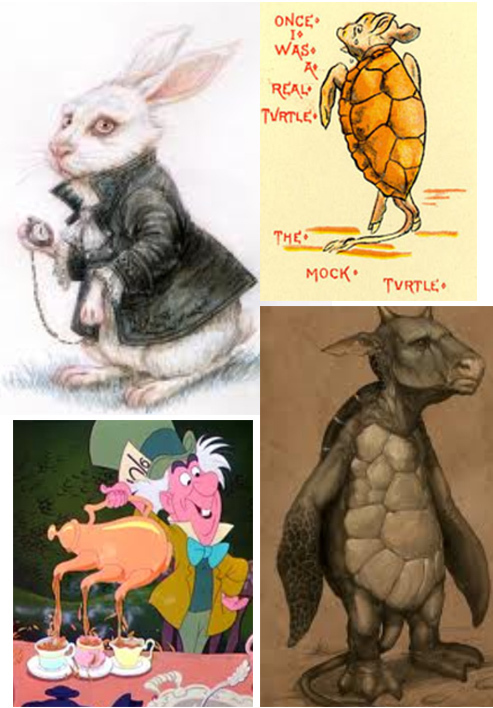 We had to imagine the improbable, enigmatic, and upside down child-like fantasy. We all benefited from Susan’s teachings; resulting in expressive, individualistic, highly textured and coloured work. Susan Flight instructs the class. Peter working with his class. My three spouted teapot. ﻿﻿﻿﻿﻿﻿﻿﻿﻿﻿﻿﻿﻿﻿﻿Alongside Susan, also tutoring were Peter and Julie Collis. Peter’s class created large Paper clay structures using wire armature and forms from nature. The stunning works were Pit fired during the workshop with fantastic results. Julie tutored a cast glass and Netsuke class; Netsuke is a traditional toggle to attach personal effects to pocket less Japanese garments. Students worked in plaster and lost wax technique to produce a beautiful array of glass objects. Susan St Lawrence was technical assistant, helping mainly in Peters class and braving the wet weather to complete the pit firing - she also gave a lecture on “Art as a Community Event” demonstrating the group organisation, sculptural and firing skills that she has achieved so far. Visiting artists Yanis and Monica Petzold, presented a very beautiful selection of carved and inlaid jewellery of which they have travelled the world making and selling. Raglan has a very active Art and Beach culture, the bar was full of surfers on the first two days of the workshop, Raglan harbour and township full of bikini and tog clad beachgoers, but weather conditions decided to change halfway into the course. Peter and his class had been working plein air, but had to take cover in the downstairs Mason Workshop when rain rolled in from the sea and down the mountain – this also made drying the work difficult, so peter manned the gas torch to get the work ready for the Pit firing. Unloading the pit firing was exciting; great results! right. Susan Flight during Raku Firing. The Raku firing was also done under extreme conditions; ‘Drowned Rat Raku’ I called it! But even the driving wind and rain couldn’t dampen the kiln, or the firer’s enthusiasm, and the lustrous results were equally exciting and pleasing. In reference to Susan’s lecture on community, working and socialising as a large group of artists was a thoroughly enjoyable and productive experience. With new friendships forged and much learnt in technique and process. The concluding exhibition demonstrated the great talent and joy that we were sharing together. Susan Flight holds a Bachelor of Arts from Waikato University and an Advanced Diploma of Ceramics from TAFE, Queensland. She taught secondary school art during the 1970’s then taught in numerous art Schools in New Zealand then Australia. She has exhibited extensively since 1970 and gained many study awards and grants. Thanks to Susan for facilitating and hosting this wonderful event. My finished Raku piece; White Rabbit.